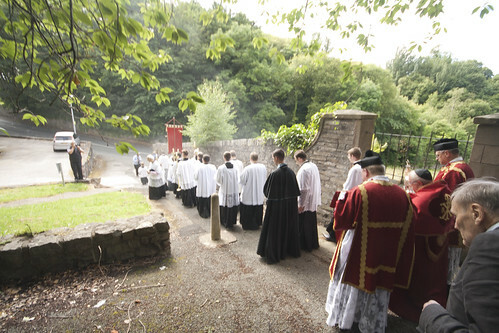 Here are some photos of the LMS Pilgrimage to Holywell, in honour of St Winefride (album on Flickr here). 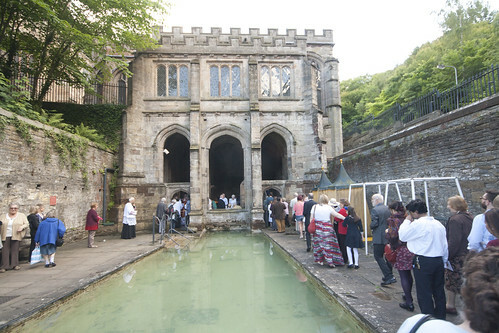 St Winefride's Well is the 'holy well' which gives Holywell its name, and the shrine around the well is unique in Britain as never having been destroyed. This may have something to do with the fact that it had been rebuilt by King Henry VIII's mother. It was continuously venerated by Catholics through Penal Times - something really remarkable - and bought back by Catholics as soon as possible. As well as Catholics from Lancashire coming down, there were many from Ireland, as one can see from the inscriptions carved into the walls giving thanks for cures. St Winefride (c.600-660) was a Welsh princess who resisted the advances of a importunate Welsh prince to the point of death, from which she was raised to life by her uncle, St Beuno. Her importance is indicated by her influence on Oxford's Saxon princess, St Frideswide (650 to 735), who was inspired by St Winifride and whose story is parallel to hers, although St Frideswide didn't actually suffer beheading. 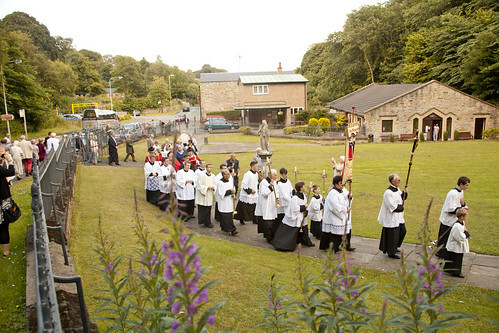 The Pilgrimage to Holywell has long been one of the Latin Mass Society's biggest annual events, and it continues to be well attended. 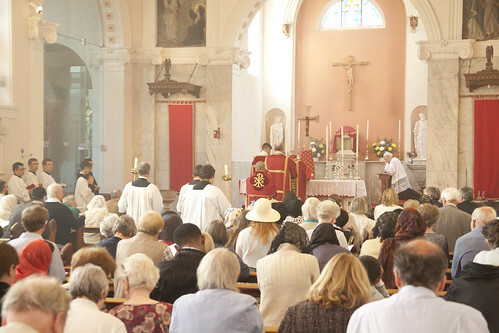 There were about 200 people in church, where Pontifical Mass was celebrated by Abbot Paul Stonham of Belmont Abbey. His vesting in the sanctuary will enrage Mgr Basil Loftus, who has an obsession with the subject for reasons which are obscure, but into every life some rain must fall. After Mass we processed to the Well and venerated a relic of St Winefride; this was followed by Benediction back in the church. 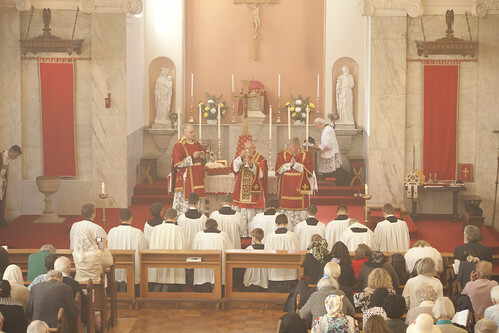 This is the kind of event which can only happen with the organisation and support of a national organisation like the Latin Mass Society. Over the years we have organised many Pontifical Masses here, a few years ago it was part of Bishop Rifan's itinerary. A coach brings people from London, and others came from all over the country. There was a choir singing polyphony as well as the chant for the Mass. 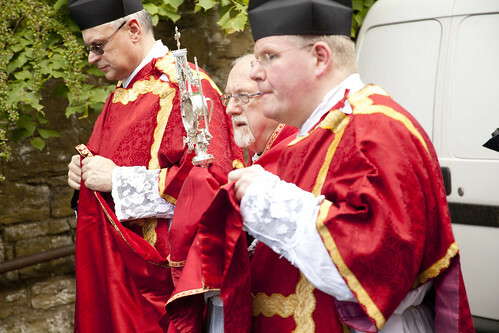 You can see from the photos the numerous priests who came from far and wide to make the Mass run smoothly, and a vast team of servers. These things don't happen by themselves. 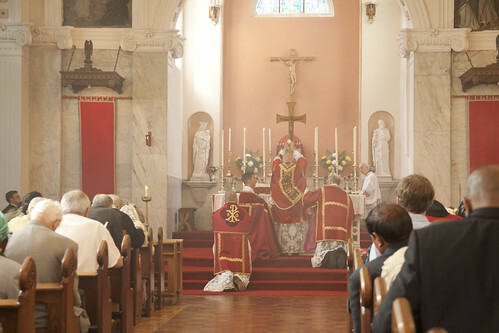 Become an Anniversary Supporter of the Latin Mass Society!